Just-raked baskets of blueberries are seen here at Spruce Mountain Blueberries in Rockport in 2010. 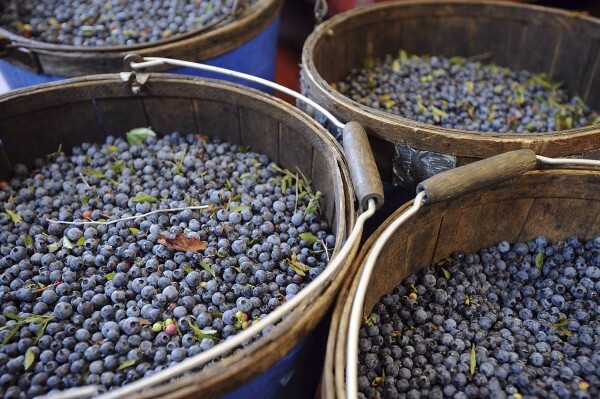 MACHIAS, Maine — Maine’s 2011 wild blueberry harvest tipped the scales at 83.1 million pounds, according to yield results calculated by the U.S. Department of Agriculture. That’s 100,000 pounds more than the 2010 crop, which the USDA estimated at 83 million pounds. While the last two crops were virtually identical in yield, prices paid to growers were up significantly in 2011, jumping from 61 cents per pound in 2010 to 85 cents per pound last year. At that price, Maine’s 2011 wild blueberry harvest was worth $70.1 million, or 42 percent more than the 2010 crop. David Yarborough, the Maine Extension Service wild blueberry specialist, said Monday that midcoast growers saw lower yields per acre than did their Down East counterparts due to wet weather during spring pollination and a lack of rainfall during the run up to harvest in late August. “The Down East berries really plumped up with the rains just before harvest,” Yarborough said. The 2011 wild blueberry crop in Canada weighed in at 132.3 million pounds, up from 125 million pounds in 2010, Yarborough said. The USDA estimates that the total U.S. blueberry crop in 2011 was 428 million pounds, including 345 million pounds of cultivated berries. Oregon accounted for 65.5 million pounds of the cultivated berries, while growers in New Jersey and Georgia had yields of 62 million pounds in each state. Yarborough said last week’s wave of record-setting high temperatures shouldn’t affect this year’s blueberry production. “It’s early enough that, at this point, the plants are dormant,” he said. Maine has 60,000 acres of blueberry barrens, with only half of those acres in production each year, given a two-year cultivation cycle. There are six companies in Maine that process, freeze and can wild blueberries, as well as one fresh-pack cooperative. An estimated 99 percent of all the berries harvested in Maine are frozen for use as a food ingredient.